My breed has the keenest eyesight of any breed, just as the bloodhound has the best nose. I am also one of the most ancient breeds, having been around for thousands and thousands of years. Greyhound is just Greyhound. 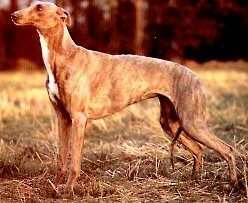 There is no known interference or crossbreeding in my heritage, making me the purest of all dog breeds. Add all of these facts to one other: I am capable of traveling in excess of 40 mph. I have a kind and gentle character and my coat requires absolute minimal grooming. Maturity comes a little later for me than some other breeds, so please take care with me until I am at least 15 months old. Then I will be able to show you what I can do. When fully grown, I am between 27 and 30 inches tall (68.6 to 76.2 centimeters) and I weigh between 60 and 70 pounds (27 to 31.5 kilograms). We have no Greyhound Breeders listed at this time. Click here to place your Greyhound Ad!